Father James Martin, S.J., takes us on pilgrimage to the Holy Land. The title of this video on YouTube is: “Pilgrimage to the Holy Land, Part 1.” That means there must be at least one more. Yes! Sorry, I couldn’t resist. He is “our” Andrew, after all. 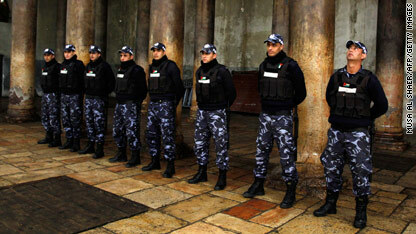 There was a “fight” between the Greek Orthodox and the Armenians in the Church of the Nativity in Bethlehem on December 28. 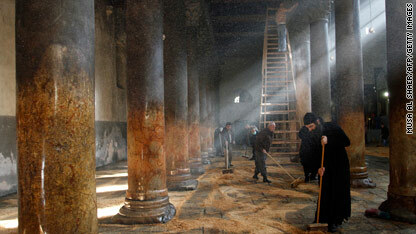 Some 50-60 priests and monks were swinging broomsticks at each other, until Palestinian police came in to break it up. The fight started while they were cleaning the church. It often happens between the three religious denominations that have rights and services within the church. There is a principle that asserts that “if you clean it, it must be yours.” The Greeks and the Armenians have certain sections of the church that are under their authority. Apparently, someone was sweeping a spot that belonged to the other, or at least so it must have been charged. Fortunately, from the Catholic point of view, the Franciscans were not involved in this one. Mr. Waseim, the computer teacher at the Latin Patriarchate School in Beit Jala (Bethlehem) had visited with us in November, along with other teachers and school personnel from the West Bank (Palestine), Israel and Jordan. 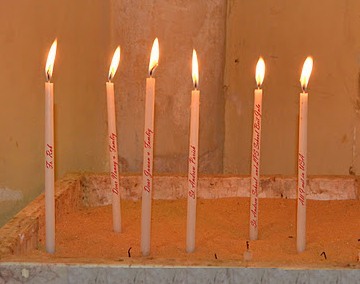 At Christmas he sent to us a photo of the candles that he lighted in Bethlehem. 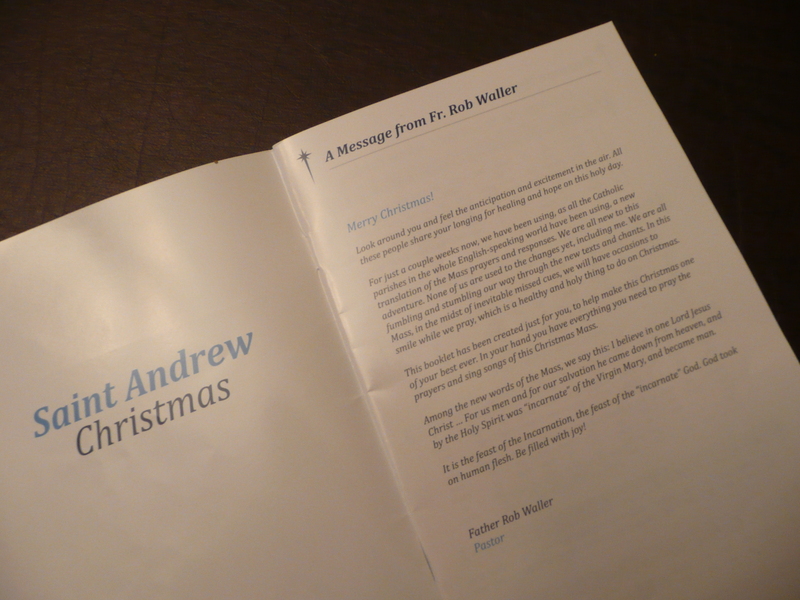 The first one (in the photo above) is for “Father Rob” and the fourth is for “St. Andrew parish.” The fifth one is for our school and his school. The last one is in thankful memory of all the people he met in the USA. Candle two and three are for Nancy and JoAnne, two of our parishioners here at St. Andrew who spent a great deal of love – and sweat and blood – preparing for the visit of the teachers and dealing with all the intricacies and details during their days with us. 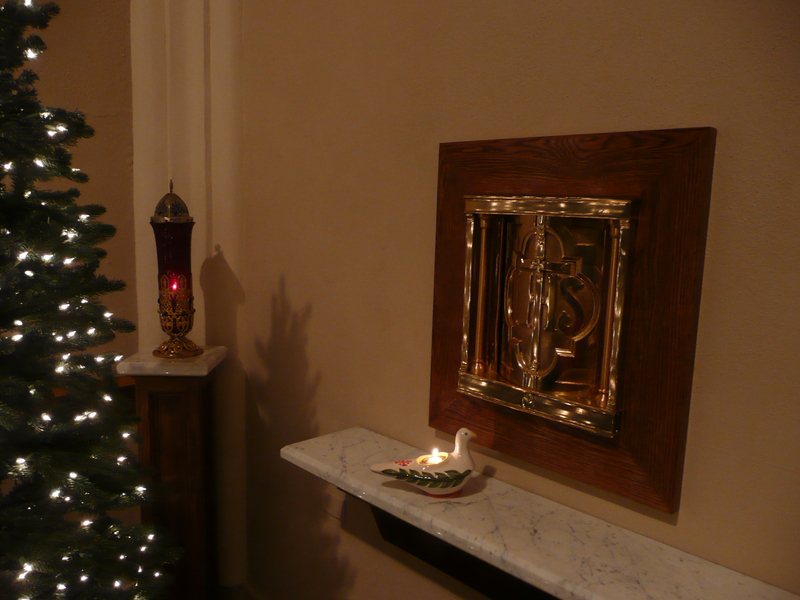 At Midnight Mass here at St. Andrew we lighted a peace candle for them. 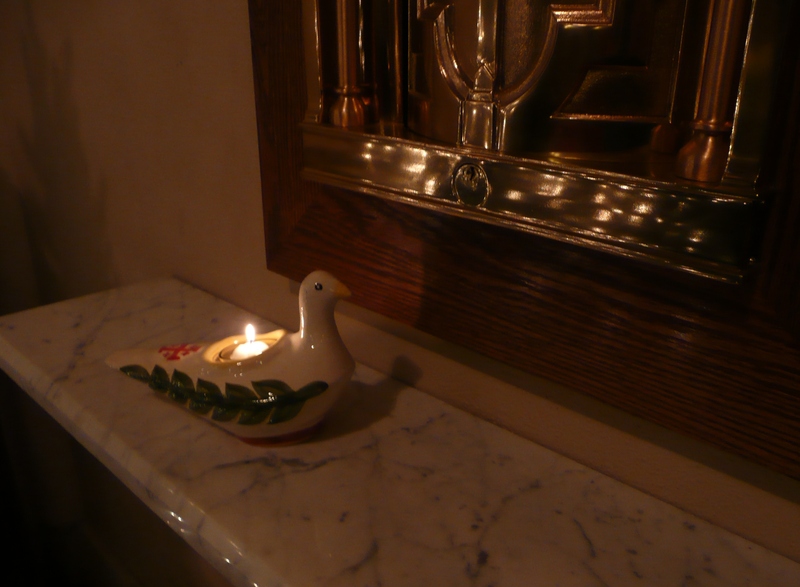 I had purchased the peace-dove at the Catholic parish in Taybeh in the West Bank, and brought it back with me for this purpose on this night. Our hope is that it was as good for our friends in the Holy Land to know that we remembered them as it was for us to know that they remembered us in the very town where Jesus was born on the very night on which we celebrate his birth. 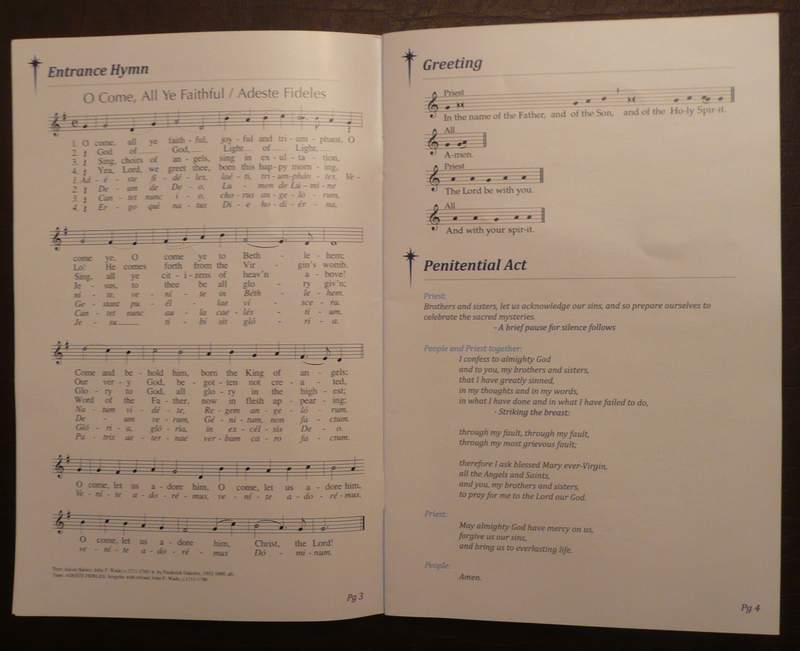 Our goal was to make everyone as welcome and as comfortable at Christmas Masses as possible, by having ready for them a worship aid in which the “new words and chants” would follow one page after another, along with every song and response. We think we succeeded. It was expensive – and worth it. 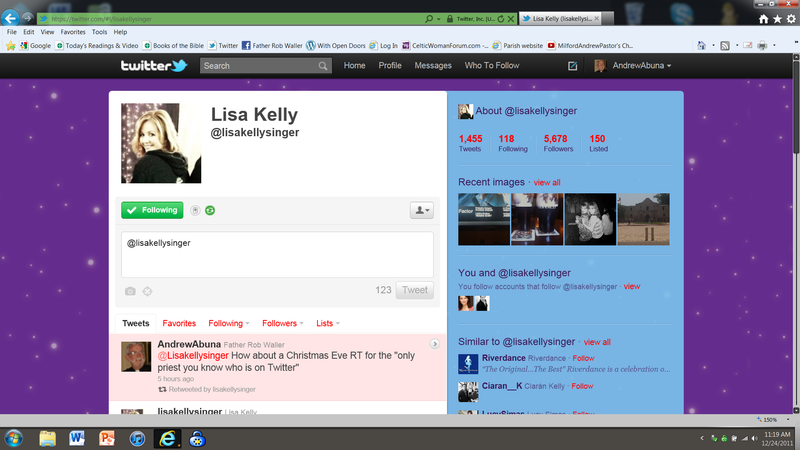 On the opening page was a message from yours truly. Look around you and feel the anticipation and excitement in the air. All these people share your longing for healing and hope on this holy day. 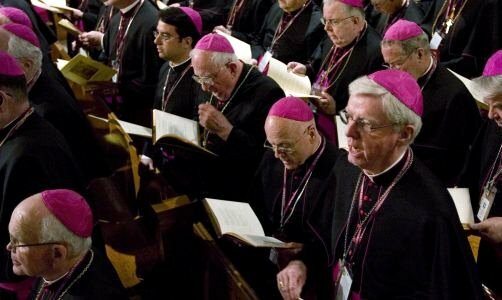 For just a couple weeks now, we have been using, as all the Catholic parishes in the whole English-speaking world have been using, a new translation of the Mass prayers and responses. We are all new to this adventure. None of us are used to the changes yet, including me. We are all fumbling and stumbling our way through the new texts and chants. In this Mass, in the midst of inevitable missed cues, we will have occasions to smile while we pray, which is a healthy and holy thing to do on Christmas. 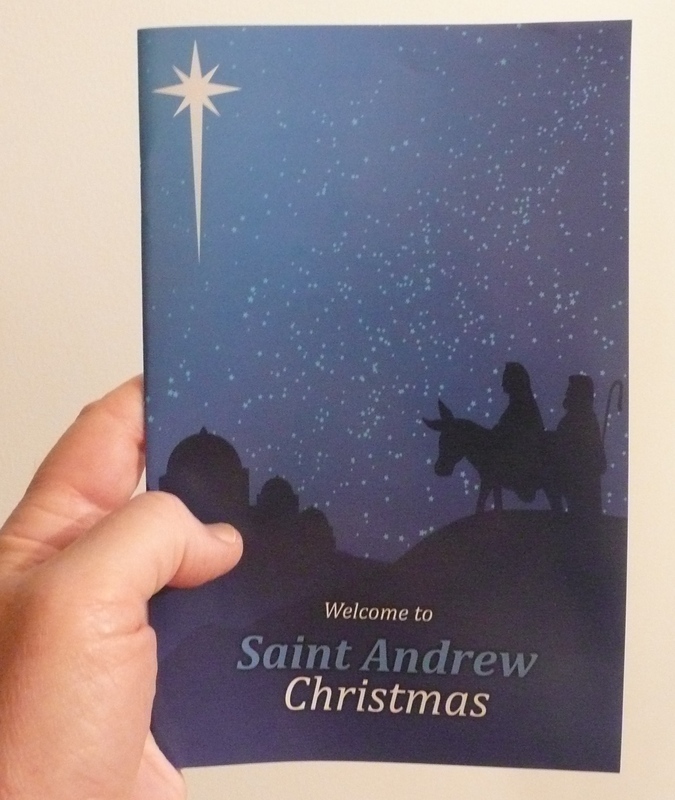 This booklet has been created just for you, to help make this Christmas one of your best ever. In your hand you have everything you need to pray the prayers and sing the songs of this Christmas Mass. Among the new words of the Mass, we say this: I believe in one Lord Jesus Christ … For us men and for our salvation he came down from heaven, and by the Holy Spirit was “incarnate” of the Virgin Mary, and became man. It is the feast of the Incarnation, the feast of the “incarnate” God. God took on human flesh. Be filled with joy! 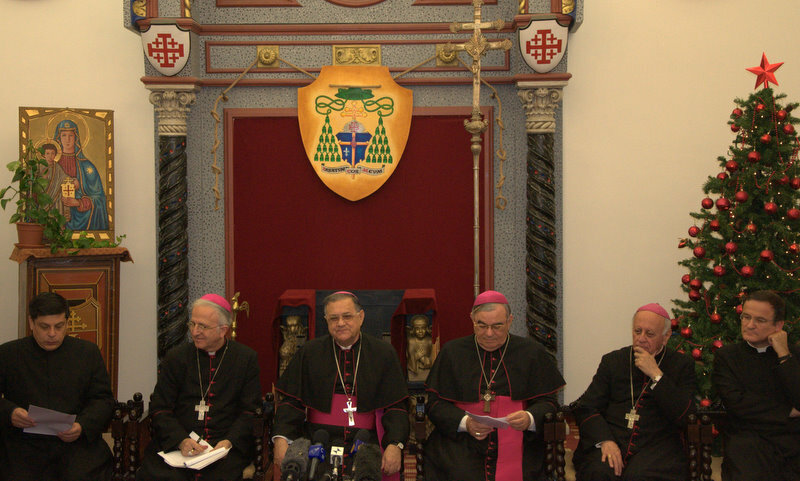 During a press conference on Wednesday, December 21, 2011, His Beatitude Fouad Twal, Latin Patriarch of Jerusalem delivered his Christmas Message in the presence of his Patriarchal Vicars. Below are two paragraphs from the text. I would like to go back to current events, to situations that we continue to follow closely, to what happened and is happening in the Arab countries. I have always defended the changes taking place in favor of freedom and democracy. I have repeatedly emphasized that Christians are not excluded from these movements. That said, I fervently hope that human rights and the dignity of each individual are respected. I also hope and pray that the competent authorities make every effort to calm the spirits without violence, and to protect the minorities who are an integral part of the population in the region. We must grasp this moment of opportunity to build a new society based on equal citizenship for all. The Catholic Patriarchs of the East together have asked our faithful to set a day of prayer for reconciliation and peace in the Middle East. Below is an account of the December 20, 2011 “visit’’ (by way of Skype) between the 3rd grade class of Miss Eman in Beit Jala and the 4th grade class of Mrs. Schweickart in Milford. Miss Eman wrote this account, which is online at the parish website of the Church of the Holy Family, Ramallah, Palestine, the Holy Land – Pastor: Father Faisal Hijazin. It can be found here. ضمن برنامج التوأمة مع مدرسة القديس اندرو في ولاية اوهايو في الولايات المتحدة الأمريكية ومدرسة البطريركية اللايتينة في بيت جالا جرى يوم الثلاثاء 20/12/2011 أول لقاء عبر الانترنت باستخدام برنامج Skype وهو اللقاء الأول من نوعه جرى في مدارس البطريركية للصفي الثالث الاساسي في المدرسة في بيت جالا وطلاب الصف الرابع من مدرسة سانت اندرو..
وقد تم التغلب على مشكلة الوقت التي واجهت طاقم التحضير لهذا فقد جرى هذا اللقاء في الساعة الرابعة عصرا حسب التوقيت الفلسطيني والساعة التاسعة صباحا حسب التوقيت في ولاية اوهايو وقد تبادل الطرفان الأسئلة حول كيفية التدريس والوقت والحياة المدرسية والاجتماعية من كلا الطرفين وأيضاً تم القاء بعض الأسئلة من كلا الطرفين والإجابة عليها. وفي آخر اللقاء تم تبادل تهاني عيد الميلاد المجيد بين الطلاب الصفين وأيضاُ قام طلابنا بتقديم ترتيلة لعيد الميلاد فيا للغة العربية وهم بدورهم رتلوا لعيد الميلاد باللغة الانجليزية. وقتم تعليمهم بعض الكلمات في اللغة العربية مثل عيد ميلاد وسعيد وغيرها وتم الاتفاق على أن يتم اعاد مثل هذه اللقاءات في المستقبل لما له من آثار ايجابية على الطرفين. وقد اشرف على تجهيز تقنيات هذا للقاء الاستاذ وسيم كسابرة من مدرسة البطريكية اللاتينية في بيت جالا مسؤول قسم الحاسوب وتكنولوجيا المعلومات في المدرسة بالإضافة الى المعلمة ايمان عمرو معلمة اللغة العربية للصف الثالث التي قامت بتحضير الطلاب لهذا اللقاء وايضاً المعلمة روجيس قمصية المسؤولة الاكاديمية في الادارة العامة لمدارس البطريركية اللاتينية وكذلك الاستاذ سهيل دعيبس من الادارة العامة وبحضور معلمة اللغة الانجليزية المعلمة سهيلة صليبي للصف الثالث ايضاَ. نتمنى الاستمرار لمثل هذه اللقاءات لسماع الصوت الفلسطيني وسماع الصوت المسيحي لكافة ارجاء العالم .